The wonderful folks at Startled Cat and the Karuna Initiative are launching a beautiful 3D AIDS Quilt this year, supported by jokaydiaGRID. I highly recommend you check this out. Read on for details. Every once in a while, I discover a beautiful project involving virtual worlds that truly focuses on improving the lives of people around the world. This is one of those rare projects. The 3D AIDS Quilt commemorates AIDS victims, creates empathy, educates about HIV/AIDS, and forges a global community through 3d immersion and interactivity. For more information, see the 3D AIDS Quilt website and be sure to follow @3DAIDSQuilt on Twitter. Picture a brightly colored, patchwork quilt composed of dozens of lovingly crafted, three dimensional rooms that allow you to walk into the lives of those who lived with AIDS. In one, you are taken into the bedroom of a teen with a passion for bugs. In another you find a rose garden where a woman named Anita loved to sit with her cat and read. In a third you encounter a home recording studio where Andrew practiced electric guitar and dreamed of being a rock star. Each room, each glimpse into an individual life, is a reminder of how much we’ve lost and how far we’ve come in our fight against HIV/AIDS. At the center of the Quilt stands an enormous tree inspired by a Japanese bonsai. Cradled in its branches is an immersive, interactive learning center where participants can explore a 3D model of the Human Immunodeficiency Virus (HIV), watch it infect a cell, and learn about AIDS history by reading the musings of Uncle D, an educator and poet who lived with the virus. Together, the dozens of rooms that comprise the Quilt and the learning center form Karuna’s 3D AIDS Quilt Project launching December 1, 2010 on World AIDS Day. The 3D AIDS Quilt was born out of the realization that the key to eradicating HIV/AIDS lies in three basic principles – Education, Empathy and Empowerment. Education to raise awareness about prevention and treatment; empathy to debunk the stigmas and stereotypes associated with HIV infection; and the empowerment that results from having the knowledge and the tools to make a difference in the fight against AIDS. The 3D AIDS Quilt was conceived as a tool for bringing individuals and leading HIV/AIDS organizations together in virtual space to create a global, engaged and diverse community committed to the eradication of HIV/AIDS. 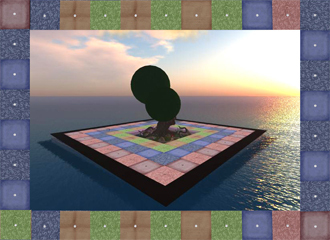 It is part of the larger Karuna Initiative, which uses story, creative collaboration, innovation, and the unique properties of virtual worlds to create positive, lasting change. This entry was posted in Announcements, Education, Virtual Worlds and tagged 3d aids quilt, aids, avatars, education, jokaydia, jokaydiagrid, karuna, karuna initiative, metaverse, online communities, quilt, second life, startled cat, virtual worlds, world aids day by John "Pathfinder" Lester. Bookmark the permalink.